This is the 3rd volume of the new edition of BSSM mangá series. I love Sailor Moon since I first watched the anime when I was 8-9 years old and when I found out there was a manga, I had to read it. The first time I did was almost 9-10 years ago, through an website who had the english scan )in very low quality, but still) and I loved it instantly. So, when the 10 year anniversary of the anime came around and Naoko Takeuchi finally released the rights to get the new edition of the manga published here in Brazil, I HAD TO BUY THIS BEAUTY BECAUSE OMG THE ARTWORK IS GORGEOUS. AND THERE ARE COLORED PAGES. Plus, even though I remembered most of the story, I needed to refresh some details.I love how darker this is, how much Takeuchi worried about the details - the greek/roman mythology references, the moon rabbit legend, the lost Moon Princess tale, the zodiac inspiration...they are in everything, from the name of the characters, to their personalities, their style, their power...it was all so well though out! - how the plot moves quickly (unlike the anime, that has too many fillers), and how progressive, for it's period, it is.This volume closes the Classic arc and starts the Black Moon arc (or R, in the anime) and because of that it's not one of my favorites. The final battle against the Dark Kingdom and Metallia is amazing and fast paced (but not rushed) and it's one of my favorite battles. The Black Moon arc is the problem. I like the idea of this arc, introducing Crystal Tokyo and some characters that will be of importance later on, but it has the only thing that makes this volume (and the next one as well) lose an entire star: ChibiUsa. THIS ANNOYING, BRATTY LITTLE GIRL MAKES ME WANT TO THROW THE MANGA OUT THE WINDOW. Seriously. Unfortunately, she's a constant in this arc, so I'll have to bear with her.On to volume 5! Woohoo!!! More Sailor Moon! This one is completely action packed as we witness the Sailors fighting Queen Metalia! Also we witness the emergence of some new enemies?? I am loving this series and looking forward to reading some more of it soon!!! Me encanta como va la historia! no esperaba que empezara con la segunda parte ya en este tomo, pero me gusta que se les está empezando a dar más protagonismo al resto de las chicas.Lo que no deja de sorprenderme es cuánto cambiaron en el anime original.En el comic del final (el de Naoko Hime) hay un spoiler mayúsculo sobre Chibi Usa, si no conocen la historia salteenlo! I am not finding this Manga super engaging. I'm pretty bored and it is a tad bit confusing at parts. I have vol 4 & 5 and I will probably attempt to read them soon but if I struggle through those as much as I did this one I will either DNF or I won't continue the series. Kind if disappointed since I LOVED the anime. These literally keep getting better and better. Can't stop, won't stop. Wasn't as good as the second book, but fun enough to continue. The feeling that the manga story is a rushed, remixed version of the anime story continues as we move on to Sailor Moon R, which I've only seen a few episodes of. The epic, worlds-shattering battle full of dramatic self-sacrifice, and then reincarnation, that ends the first story arc concludes, and then we immediately move on to the beginning of this new story. New character Chibi-Usa's introduction is weird and half-stupid, and her setting herself up as a cuckoo in Usagi's home by magically hypnotizing Usagi's parents doesn't sit well with me. I know why Chibi-Usa is drawn to Usagi and Mamoru--and there are plenty of tip-offs that make it obvious who she is--but still. I don't care for her at all, either as a character or a plot device, so it's just as well the story doesn't take long in putting more emphasis on the new enemy Black Moon Kingdom, who are kidnapping the guardians one by one.I think Takeuchi's art improved in this volume, although I couldn't tell you exactly how. Sailor Moon Volume 3 finishes up the equivalent of Season 1 of the Sailor Moon anime, and beginning the next arc of the story. In Volume 3 we see the senshi use the Moon Sword for the first time, and a much more tragic telling of the battle against Queen Beryl. As the inner senshi struggle to help Sailor Moon with the battle, Usagi fights to return Mamoru to normal and bring him back to her. As a fan who had mostly only seen the anime, it's wonderful to see more of the bond between Usagi and Mamoru that is often glossed over. Sailor Moon never moves along slowly, and the final battle is no exception to the rule. NOTE: The second arc of the manga is one place where the anime starts to depart from the series, and does not contain the 'Ail & Ann' storyline. The next arc soon begins and we are introduced to Chibi-Usa, and the Black Moon Clan. Peace never lasts however, and things quickly begin to fall apart for the Sailor Senshi.Fans of the the use of the Japanese names will be happy to know that this has followed through to the Black Moon clan, and we see 'Demando' instead of 'Diamond' and 'Chibi-Usa' rather than 'Rini'.I was extremely happy to see the gorgeous color pages at the beginning of the volume, as these are beautifully detailed and painted. In a bit of fan-girl squeeing, I was also happy to see the use of the image showing the inner senshi paired with the four generals as well for a chapter image and use of Mamoru's actual abilities as Prince of the Earth. So glad I have Volume 4! Another absolutely gorgeous job done by Kodansha USA on rereleasing this series! LOVED the color plates and new translation! I really loved all the pretty transformations in this volume, the new magical powers and crystal things, and the way that Usagi finds strength and bravery from the encouragement of her friends and her love for Tuxedo Mask. I love how the Sailors all band together, willing to give their lives for each other, fighting against evil, and generally being awesome!Chibi-Usa was always a weird character to me. She just never seemed to fit into the story, in my mind. Somehow I don't remember her being introduced this early in the story, but here she is, being all mysterious and bratty. With each volume I'm becoming more and more engrossed. Seeing the original story line in the mangas is awesome. Like knowing who Queen Metalia is, and who the four kings of heaven really are. I knew Zoisite was supposed to be male, but not that they were Prince Endymion's guards. I am truly in love with these stories. my feelings!!! I need more!!! Ah, the end of the Dark Kingdom arc, and the beginning of the Black Moon Arc. While I thoroughly enjoyed the finale of the Dark Kingdom arc, and I have to say I have a bit of a girl crush on Sailor Venus now, it was choppy. Which surprises me as this is the third addition to the series. Usually meaning story and art panels become smoother. Not choppier. The finale was indeed choppy. If it had been a bit smoother this volume probably would have gotten a higher rating from me. Alas, the chop-chop and then the "villain of the week" comes back. And even they were a tad skippy.That being said, I really-really-really liked the wrap up of the Dark Kingdom arc. The romance between Usagi and Mamoru has hit that beautiful sweet spot. Or as I like to call it, the "ahhhhhh" moment. Combining past lives into a present day romance, tragedy, and by it's own right a happy ending. While it's not the end, clearly, it's a happy one for the story arc. Even better, is that while Usagi and Princess Serenity officially become one, Usagi states it's still her. There is a more mature side of her present and continues to grow, but I still love that she’s still her silly self. Which readers get to see in old-school Princess Serenity. I'm still a weeeee bit bummed that the other characters aren't getting more development. There's some, especially as someone is slowly picking off the Scouts. But it doesn't really make me feel closer to the ladies. Sailor Venus had some amazing page time as the true leader of the Sailor Scout’s group as she does everything in her power to protect the Princess/Queen of the Moon. A-mazing. I can see why Takeuchi created SailorV first, and kept her in the Sailor Moon universe. (Yeah, see my girl crush is shining. )The mini-Usagi, or Usa/Chibiusa, has been a character that made me lose interest in the Anime after she was introduced. (OK, I lied—again—I made an anime reference. Sorry!) Mainly because I found the character even more annoying then the Anime version of Usagi. Chibiusa really hasn't gotten much page time at this point. Instead of seeming like a brat, she comes off as a lost child. One who's lost her parents and clearly needs Sailor Moon's help. Now if only the Scouts could help themselves! If it wasn't for the powerful ending of the Dark Kingdom arc 2/5 would be my solid rating. The new storyline isn't starting out terribly strong and the choppiness isn't helping. There are some moments that I did enjoy in the opening of the Black Moon arc. I just wish things were more . . . fleshed out. Dare I say, more time spent on opening this up. Yep, I'm saying maybe a chapter dedicated to getting to know our characters more and building up the new trouble brewing for our Sailor Scouts!Sexual Content: Kissing. Clean. Maybe a bromance!3/5- Adored it, just a few minor details held it back.Originally reviewed at Book Whispers. I just...This series is so well known, and it generally is talked about in a positive light. I really, really wanted to like it.But I couldn't. I read the first two, and the majority of the third volume (this one), and I just had to stop. The plot is predictable and boring, the characters are barely, if at all, distinguishable from one another, and the art, though sometimes beautiful, often annoys me in how busy it is. I felt overwhelmed in many panels, as they seemed cluttered and I didn't know what was going on. The worst part, though, was the writing. This is probably due to the translation, but the writing is horrible. The dialogue doesn't flow and it doesn't seem real, especially for teenagers. Also, every time the light crystal is mentioned, it's name is in quotes, which is like nails on a chalkboard for me.Not to mention, the title of the series in this publication is "Pretty Guardian Sailor Moon?" What? Really? "Pretty Guardian?" Why? It's unnecessary, and sexist.I love reading manga. I've never read a manga and not been able to finish it before, but this one was that bad. I wish I could understand the hype over this series. Favorite Scan in volume 3. 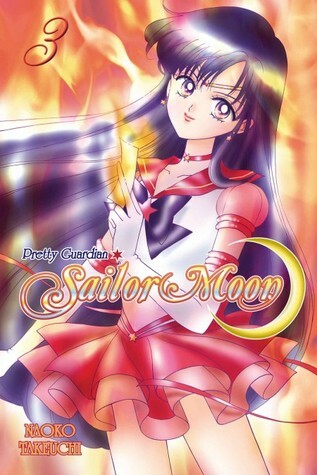 [Dawww]Volume 3 of Pretty Guardian Sailor Moon [HBIC Sailor Mars is the cover] is the ending of the Dark Kingdom arch and the beginning of the Black Moon arc. We see Usagi come into her own and utilizing all her powers to finally fight the great evil that destroyed ruined both her lives.The Black Moon arc starts with Chibi-Usa [aka Rini aka Trunks] arriving lip first onto earth and integrating herself into Usagi's life. Unfortunately, with her arrival brings a new enemy who is also searching for the Silver Imperium Crystal and start attacking the Sailor Scouts. It is a fairly weak beginning to a really good arc as it is pretty much the exact same "one villain attacks one scout" formula we saw previously. I am looking forward to the rest of the story unfolding and how Usagi deals with this new danger. One notable change that I like in the manga rather than the anime is that Mamoru actually has some powers which makes sense because he is a "Sailor Scout." It makes him more than just a damsel in distress. This book has the end of the Queen Beryl arc and the beginning of the Dark Moon story arc, and while the beginning of the Dark Moon arc is not the strongest, it's the electrifying conclusion to Usagi's fight against Metalia is good enough to push this book from a 3 to a 4 star. It's also the start of seeing Usagi's friends get methodologically kidnapped - and yes, I'll be that jerk and ask why not Venus, but I guess she actually served a larger purpose for the story? The art of Usagi in action as Sailor Moon, however, is as gorgeous as ever. Plus, Chibiusa and Luna-P are super cute.